Keeping up with my New Year's resolution of reading one book a month for the year of 2017...here is the one I just finished for February. I chose The Husband's Secret by Liane Moriarty. I know I am majorly late to the party on this one as many of you were reading it ages ago, but I'm glad I still took the time to read it. I really enjoyed the story, and if you ladies would recommend any of Moriatry's other books, let me know! I'm interested in what else from her collection might be good to pick up. The story follows three different women, Cecilia, Tess, and Rachel. At first, it was a bit confusing to keep up with all the different story lines as the book jumped back and forth...but I got used to it quickly and it became really interesting to start and wonder how they were all going to connect further into the story. 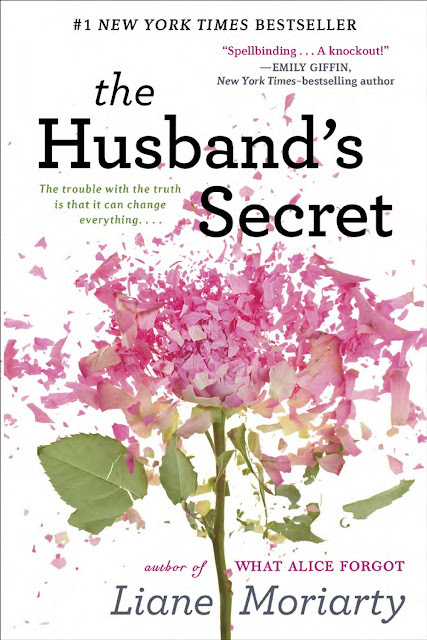 Tess is a wife and mother who finds out her husband and cousin/best friend have fallen in love with each other. So she scoops up her son and heads to stay with her mother in Sydney, unsure of how to deal with the situation or move forward from here. It took me a little bit to get going with this book, but once I did, I finished the bulk of it in two days. There is a definite point where it grabs your interest and you start to hypothesize possible scenarios and ponder how the lives of these three woman are going to overlap. I was able to guess the twist before it was revealed, but it didn't take away from the story at all...I was just as intrigued to see how things would play out. Definitely a good read and well written, since you are able to simultaneously follow three different story lines at the same time! I went to Half Priced Books the other weekend and stocked up on a bunch of new things to read...so I have a lot to choose from, but I think the next book up for the month of March will be this one. I've heard such good things about this one, but have never read it-- I started it, but didn't finish it before it was due back to the library and then had the ending spoiled, so it took away from me ever wanting to try and read it again. Big Little Lies had one of the most shocking/surprising endings of a book. I enjoyed Liane's book - Big little lies! This book is currently in my room needing to be read! I've renewed it from the library twice now and just haven't found the time to start reading it!